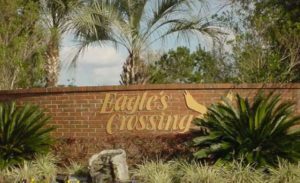 Eagles Crossing is located near Longwood-Lake Mary Road, just off Humphrey Road. With just 44 homes this subdivision offers a convenient location that is just down the street from the new multi-million dollar Griffin Farm Town Center in the mid-town Lake Mary area. Prices from about $400-$500,000 and lots on the west side are 3/4 acres and up while interior feature pond frontage. Also easy access to Lake Mary High School, the Library, YMCA, I4 and SR 427. With great Lake Mary Schools, oversized lots and custom homes and a great family location.